Event founder and director Mark Griffith. Mark founded Skinny Tire Events eighteen years ago following the passing of his brother Duane to cancer. When not caught up in SKINNY events or building the White Horse home development in Moab, he can be found riding his bike, playing guitar, or hanging out with his family and friends. Beth is the behind the scenes go-to woman for registration, information, or donations. When not responding to emails, she is either hanging with their 14 year old daughter Tanyon or coaching clients to optimal health. Ask Beth for her Top Ten Healthy Tips and Most Delectable Easy To Prepare Recipes. Steve is the logistics man coordinating tables, banners, food, water, and all supplies needed to make this event great for you. Up at 4am to set up road signs and lingering at the tail end of the day to retrieve all items so that the event leaves no trace, Steve has a background as a river runner as seen pictured here with his 12 year old daughter. Steve is known locally as the man who fixes Moab one hinge at a time. Dan is affectionately called "volunteer Dan" because he tirelessly provides all kinds of support and assistance to make these events happen smoothly! 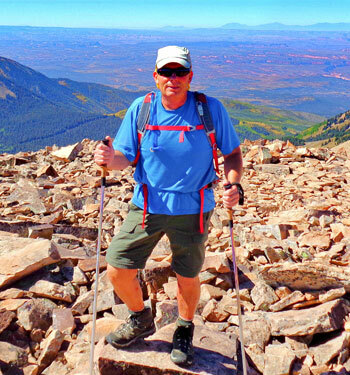 When not in Moab talking with the Skinny Tire Festival or Moab Century Tour cyclists, he is most likely hiking somewhere in the San Juan Mountain Range of Southern Colorado. Don and Angee travel to Moab twice a year from their home in Colorado, bringing 30 of their closest friends with them! Together they make up the 5-Star-Communications Team supporting cyclists with radio communications on all routes. Have a flat tire? Need medical attention? Want a ride up that next hill? Wave down a SAG shuttle, stop into an AID station, or Call-A-Sag and Angee, Don and their team of INCREDIBLE volunteers will be there to help. Mark and his wonder dog Hope drive the Sheri Griffith River Expeditions shuttle van that can give you a lift or connect you with a mechanic to repair a busted tube. A long time friend of Skinny Tire Events, Mark is one of the sincerest and nicest people you’ll ever get a chance to meet. Volunteers Extraordinaire! Steve Moore and Ellen Powers from Partners Capital Management began hosting AID stations when the Skinny Tire Festival began. They travel to see clients all over the country and while working with their Moab clients they decided to contribute to our local cause. Joined by good friends Ricky and Chris Daly, these two couples will make sure your needs are met, that you are having fun, and we guarantee, they’ll have a lot of fun while doing it!